You need to mark you calendar for Thursday, the 23rd of September 2010, if you're in the UK it will be 19:00 BST (which is 18:00 hrs GMT), 20:00 hrs CEST if you're on the continent and I'm afraid you'll have to calculate it yourself if you're anywhere else. As you all know last year’s show was broadcast live from the Makers Mark distillery in Kentucky. This was because our two best selling expressions, 10 year old and Quarter Cask are matured exclusively in Bourbon casks. 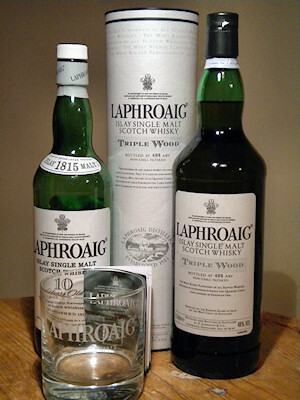 However this is only part of the Laphroaig story. We have been using the finest Sherry casks from Spain since our inception nearly 200 years ago and still use them to this day as they impart a completely different flavour to our spirit. During the show we will be comparing classic bourbon matured Laphroaig –in this case Quarter Cask, with three other Laphroaig expressions. Our new Triple Wood which enjoys its third maturation in Spanish Oak, our cask strength 25 year old which uses both Fino and Oloroso sherry Butts in its maturation and a very special third, exclusively Oloroso matured expression – but you will have to watch the programme to find out more about this one!